This brochure advertises the services of four trains of the Chicago, Rock Island and Pacific Railroad. Two of the trains are from Chicago and Omaha and the other two are from St. Louis and Kansas City. 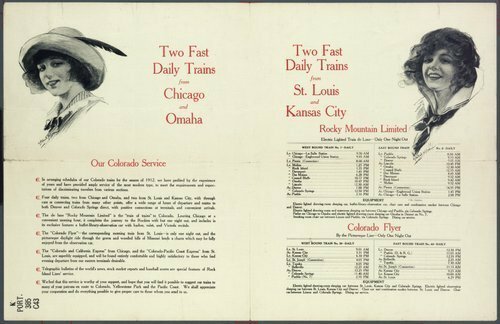 The trains from Chicago and Omaha are the "Rocky Mountain Limited" and the "Colorado and California Express" The two trains from St. Louis and Kansas City are the "Colorado-Pacific Coast Express" and the "Colorado Flyer." The daily schedules for each train are included. Such features as electric lighted cars; a buffet-library-observation car with barber, valet and Victrola recitals; and telegraphic bulletins.